Generally, bicyclists and other operators of human powered vehicles have the same rights and duties as other drivers unless specified in the statutes. (1)No person shall drive a vehicle on a highway at a speed greater than is reasonable and prudent under the conditions and having regard to the actual and potential hazards then existing. but are not subject to the slow speed and impeding traffic provision because they are not motor vehicles. Under certain conditions, cyclists must keep right and in bike lanes, but there are many exceptions specified in the statutes. 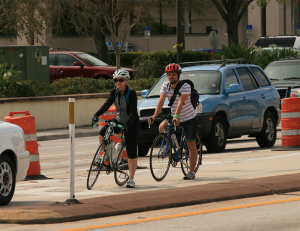 Bicyclists on the sidewalk have the same rights and duties as pedestrians. The most basic right of all vehicle operators, including bicyclists, is that they are entitled to the use of the roadway. Question Steve asked: Do y’all think it would be a good idea to have the law changed to specifically define quadricycles as bicycles so that they can be legally ridden like any other bicycle? Question Jeremy asked: What laws are different for a tricycle (I have a recumbent tadpole-style, not electric) than for a bicycle?